The Drive 4 UR School test-drive program sponsored by Leo Kaytes Ford of Warwick and the Ford Motor Company raised $8,000 for WVCSD’s athletic teams and clubs. 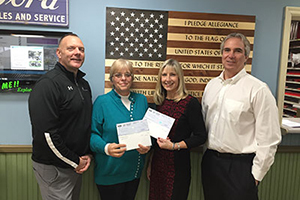 Leo Kaytes Jr. (right), and Leslie Culkin (left), presented Drive 4 UR School donations on behalf of the Ford Motor Company to WVCSD’s Gregory Sirico (left) and Heidi Thonus (right). The one-day event took place during the homecoming football game, on Saturday, October 15, 2016. For every test-drive of a new Ford vehicle at Leo Kaytes, the Ford Motor Company made a donation to Warwick Valley schools. Participating test-drivers had the option to designate an athletic team or club as the recipient. During the eight years Leo Kaytes Ford has sponsored Drive 4 UR School, the company has raised over $48,000 for Warwick Valley schools. “The event was a huge success and a great opportunity for the district’s athletics program. We are very grateful to the staff at Leo Kaytes Ford, namely, Leslie Culkin, Leo Kaytes Jr. and Leo Kaytes Sr. for their continued support,” said Gregory Sirico, director of athletics. This page is maintained by the WVCSD Communications Office according to the web publishing guidelines of Warwick Valley Central School District. The district is not responsible for facts or opinions contained on any linked site. © 2015 All rights reserved. Produced by the Capital Region BOCES Communications Service. WVCSD website accessibility guidelines. Some files and features on this site require Adobe Reader or Adobe Flash Player to view.